PALM COAST - Sections 1 through 19. ITT Levitts, later ITT CDC, Restrictive Covenents and Easements and other Amended Restrictive Covenants and Easements. These were recorded in the Official Record Book 119, Pages 0641-0659, Flagler County, Florida. ITT Levitts; , later ITT CDC, Restrictive Covenants and Easements. ITT Levitts Restrictive Covenants and Easements, these were later 'Amended' and 'Recorded' . 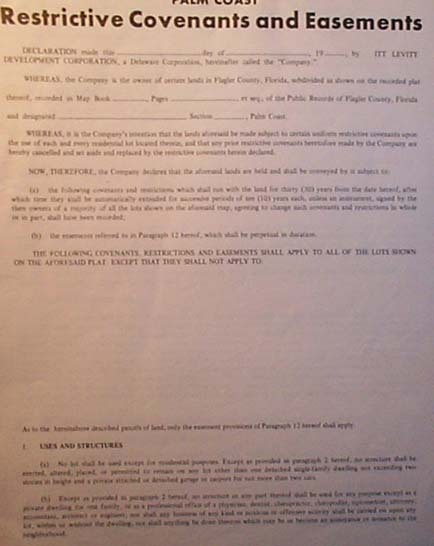 A Copy of another 'Amemded' ITT Community Development Corporation, a Delaware corporationn, hereinafter referred to as 'Company' - Palm Coast Restrictive Covenants and Easements - Recorded in Official Record Book 119, Pages 0641 0659, Flagler County, Florida Page 1 of 20 L.E 60000. REV 4/89 4/89.10M PP. 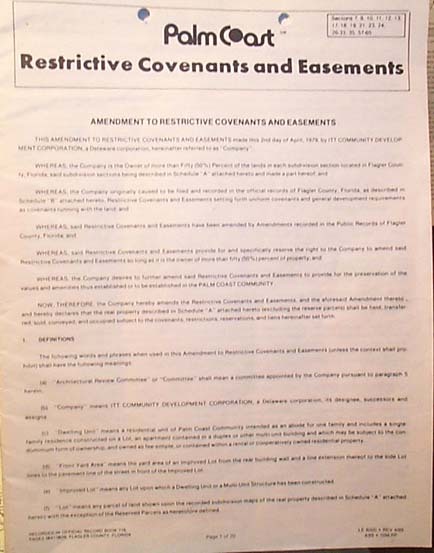 A Page from ITT Levitts' Restrictive Covenants and Easements; there were Amended Copies Recorded . (a) No lot shall be used except for residential purposes. Except as provided in paragraph 2 hereof, no structure shall be erected, altered, placed, or permitted to remain on any lot other than one detached single-family dwelling not exceeding two stories in height and a private attached or detached garage or carport for not more than two cars. (b) Except as provided in paragraph 2 hereof, no structure or any part thereof shall be used for any purpose except as a private dwelling for one family, or as a professional office of a physician, dentist, chiropractor, chiropodist, optometrist, attorney, accountant, architect, or engineer, nor shall any business of any kind or noxious or offensive activity shall be carried on upon any lot, within or without the dwelling, nor shall anything be done thereon which may be or become an annoyance or nuisance to the neighborhood. (c) No motor vehicle other than a private passenger type shall be garaged or stored in any garage or carport in any lot. In the event that a multi-unit building is placed on any contiguous lots, as provided in paragraph 2, hereof, then one parking space shall be provided on the property's site for each living unit contained therein. No detached garage or detached carport , on any lot, shall project beyond the front of the structure thereon. (d,) Except for a reasonable period during the actual construction of a residence, no trailer, tent, shack or other such structure shall be erected on or used on any lot, except with the express written permission of the Architectural Committee; in no even shall such structure be used as living quarters. 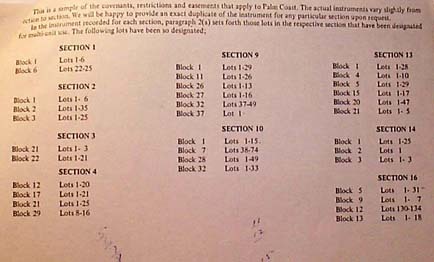 (b) On those lots designated in sub-paragraph (a) of this paragraph 2, the following number of living units may be permitted in one structure: One lot- 2 units; 2 contiguous lots - 6 units. Notwithstanding the terms of this paragraph 2, no multi-unit structures may be built without the approval of the Architectural Committee, as set forth in paragraph 3 of these restrictive covenants. (c) In the event that multi-unit structures are erected as herein provided, one parking space shall be provided on the property's site, for each living unit contained therein. (a) No structure shall be built on a lot having an area less than 10,000 square feet, except that as to those lots which abut a waterway, having direct access to the Intracoastal Waterway, there shall be no structure built on a lot having an area less than 7,000 square feet. (b) No structure shall be built on a lot having a width of less than 70 feet ( at the building line of such structure) except that no structure shall be built on a lot which abuts a waterway having direct access to the Intracoastal Waterway of less than 55 feet ( at the building line of such structure). (c) No part of any structure shall be located nearer than: 25 feet to the front lot line; 20 feet to the rear lot line, 7 1/2 feet from the side lot line; 25 feet to the side street line of a corner lot. (d) Swimming pools shall not be sonctructed less than 10 feet from rear and side lot lines. Pools constructed in front or back yards , if approved by the Architectural Committee, shall be effectively screened. (e) The ground floor area of the building, exclusive of one-story open porches, garages and carports, shall not be less than 800 square feet, except that where a lot consists of a multi-unit structure, as provided in Paragraph 2, hereof, the minimum combined living area of each unit shall be 600 square feet. No radio, television or similar tower shall be erected on any lot or attached to any building except that a radio or television antenna may be attached to any building provided it (a) does not project more than ten feet above the roof and (b) is connected to the roof solely by a single tubular support. No oil drilling, oil development operations, oil refining, quarrying or mining operations of any kind shall not be permitted upon or in any lot nor shall oil wells, tanks, tunnels, mineral excavations or shafts be permitted upon or in any lot. No derrick or other structure designed for use in boring for oil or natural gas shall be erected, maintained or permitted upon any lot. No animals, livestock or poutry of any kind shall be raised, bred or kept in any lot, except that not more than two dogs, cats or other demesticated pets may be kept, provided that they are not kept, bred or maintained for any commercial purpose. No fence or wall shall be erected or maintained in the front beyond the front building setback line. No hedge over three (3) feet in height shall be permitted along the front lot line. No fence or hedge shall be erected or maintained which shall unreasonably restrict or block the view from an adjoining lot, or obstruct sight lines at corners and at intersections of driveways with streets, or which shall materially impair the continuity of the general landscaping plan. For this purpose, any fence or hedge erected or maintained which shall exceed three feet in height must have the prior written approval of the Architectural Committee, which shall also approve the material and design of any fence. Any electrical or mechanical equipment, if otherwise visible from any street, shall be completely shielded therefrom by shrubbery or by an enclosure that conforms in architecture, material and color of the dwelling. Garbage or rubbish shall not be dumped or burned or allowed to remain on any lot except that garbage, rubbish or other debris, properly contained in a metal or plastic receptable, may be placed outside the dwelling for collection on the day of and prior to the time of scheduled collection, in accordance with the regulations of the collection agency. At all other times, such receptables shall be placed on the lot so as not to be visible from the road. 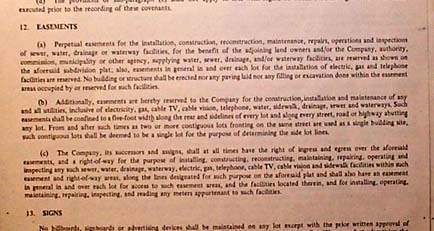 (a) All building shall be connected at the lot owner's expense to central water and sewer facilities within ninety (90) days after such utilities, or either of them, have been made available., except that wells may be maintained thereafter for outside use, including sprinkling, pools and air conditioning., if otherwise permitted by law. After the connection date aforesaid, no cesspools, septic tanks or other individual or privately owned sewage disposal system shall be installed or permitted to be used on any lot. (i) The lot owner shall pay the connection fee applicable to the central water system on the date that the system is connected to the building. The connection fee is estimated to be $50.00 , as of the date that this instrument has been initially recorded. or at any time the company coveys title to the lot, whichever date occurs later. The fee for connection to the central sewer system is estimated to be $500.00 , as of the date this instrument has been initially recorded. (iii) If contiguous lots are used for a multi-unit structure as provided in paragraph 2 hereof, then the connection fees with respect to the central water and sewer systems are estimated to be $50.00 and $500.00 for connection to the central water and sewer systems respectively, for each residential units. The said connection fees, in the case of multi-unit structures shall be paid in the same manner as herinabove stated. (iv) Since the foregoing amounts reflect construction, installation and materials costs prevailing on the date hereof, they are subject always to future adjustments, at any time and from time to time, to reflect such costs as they may exist on the date herinabove set forth. (c) It is expressly understood and agreed that the connection fees described in sub-paragraph (b) of this paragraph 11, and all charges for water and sewer service at rates as may be, from time to time, established, shall be and constitutes liens and encumbrances on the land affected thereby and any improvement thereon, and that by the acceptance of title to any of the land with respect to which these covenants and restrictions are imposed, the owner or owners thereof shall be deemed to have agreed to the imposition of such liens and encumbrances. It is further expressly understood and agreed that such connection fees will become a lien or encumbrance on the date on which the respective connection fees are due, as herinabove provided. Charges for water and sewer service will become a lien or encumbrance upon the rendering of bills or statements from the same Said liens may be enforced in the manner provided by law by or on behalf of the Company or any other person, firm or corporation to whom such connection fees or charges due. 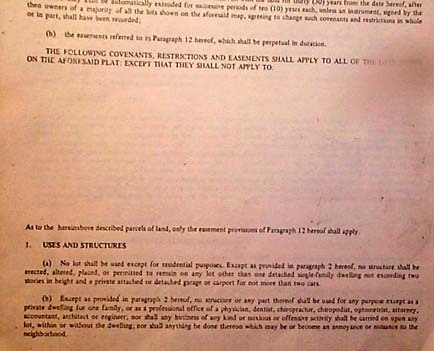 (d) The provisions of sub-paragraph (c) shall not apply to lots with regard to which Purchase Agreements have been executed prior to the recording of these covenants. (a) Perpetual easements for the installation, construction, reconstruction, maintenance, repairs, operations and inspections of sewer, water, drainage or waterway facilities, for the benefit of the adjoining land owners and/or the /Company, authority, commission, municipality or other agency, supplying water, sewer, drainage, and/or waterway facilities, are reserved as shown on the aforesaid subdivision plat; also, easement in general in and over each lot for the installation of electric, gas and telephone facilities are reserved. No building or structure shall be erected nor any paving laid nor any filling or excavation done within the easement areas occupied by or reserved for such facilities. (b) Additionally, easements are hereby reserved to the Company for the construction, installation and maintenance of any and all utilities, inclusive of electricity, gas, cable TV, cable vision, telephone, water , sidewalk, drainage, sewer and waterways. Such easements shall be confined to a five-foot width along the rear and sidelines of every lot and along every street, road or highway abutting any lot. From and after such times as two or more contiguous lots fronting on the same street are used as a single building site, such contiguous lots shall be deemed to be a single lot for the purpose of determining the side lot lines. (c) The Company, its successors and assigns, shall at all times have the right of ingress and egress over the aforesaid easements, and right-of-way for the purpose of installing, constructing, reconstructing, maintaining, repairing, operating and inspecting any such sewer, water, drainage, waterway, electric, gas, telephone, cable TV , Cable vision and sidewalk facilities within such easement and right-of-way areas, along the lines designated for such purpose on the aforesaid plat and shall also have an easement in general in and over each lot for access to such easement areas, and the facilities located therein, and for installing, operating, maintaining, repairing, inspecting, and reading any meters appurtenant to such facilities. No billboards, signboards or advertising devices shall be maintained on any lot except with the prior written approval of the Architectural Committee. Such approval shall not be required for one sign of not more than five (5) square feet advertising the property for sale or rent, or signs used by the builder advertising the property during construction and sales period or a professional sign or not more than 1 1/2 square feet. A professional sign shall not be illuminated except by non-flashing white light emanating from within or on the sign itself, and so shielded that it illuminates the face of the sign, only. As used herinabove and herinafter the term "Waterway" shall mean and include all water courses including, but not limited to , streams, rivers, lakes, canals, lagoons, channels, or other bodies of water whether naturally existing, or constructed or excavated, to the extent that such waters and/or shores thereof lie within the boundaries of the tract herinabove described, and whether such water courses are navigable or non-navigable. 15. Preservation and protection of shores and channels. (i) not excavate, dredge, modify, or alter any land grades, land elevations, earth work, shore stabilizer of treatment, riprap, sod, planting, bank protection and/or soil cover nor shall he permit any such act. (ii) at his expense, maintain in good condition, order and repair, in accordance with such reasonable standards as the Company may establish, all earth works, sod plantings, bank protection, lawn or other soil cover. (iii) not dump, or place, nor permit to be dumped or placed, any earth, stone or other fill material or any solid material or waste of any kind in any waterway, nor shall he remove, nor permit to be removed, from any waterway any earth, sand or other fill. (iv) not damage, destroy, break, tunnel under, tamper with, alter, modify or change in any manner or degree any bulkhead, deadman anchor, bulkhead cap, riprap or other shore treatment, preservative or installation. (v) not attach or affix, or moor or dock, not permit to be attached or affixed, or moored or docked to any bulkhead or bulkhead cap any cleat, pole, bitt or other device or attachment of any kind without prior written consent of the Architectural Committee. In addition to the restrictions,k reservations and provisions herein provided, as between the Company and party or parties who hereafter may acquire title to any lot or property fronting on any waterway, the Company does hereby specifically reserve, and unless otherwise specifically provided in any future deeds or conveyances, the Company shall be understood to reserve, all riparian and property rights requisite and appropriate to enforce the restrictions and declarations herein set forth, except that the Company does not now undertake nor has it undertaken any obligation to maintain any canal or other waterway or to maintain any bulkhead, deadpan anchor, bulkhead cap, riprap or other similar related installation. (I) the supporting structural members of all piers shall consist only of steel, aluminum or concrete or provided same is approved by the Architectural Committee in writing) creosote and equivalently treated timber pile. Wood, provided it has been weatherproofed by creosote or equivalent treatment, may be used for pier docking and for free-standing mooring piles, but not otherwise, for structures which are subject to this paragraph 15(co). (ii) no docks or piers shall extend more than 12 feet into the waterway unless such waterway is 100 feet or more in width, in which case they may extend 16 feet, in both instances as measured at right angles to and from the property line abutting the waterway. (iii) unless the Architectural Committee and owners of the lots immediately adjacent consent in writing, the owner of any lot shall not build a pier, if otherwise permitted hereunder, other than perpendicular to the shore line and positioned so that the center line of such pier shall be at the center of the waterfront line of such lot. (iv) for the purpose of allowing the maximum utilization of the shoreline and navigable waterways for the enjoyment of all owners, and so as not to allow any property owner to infringe upon the used of said shoreline and waterways by any adjoining property owners, the Company hereby reserves the right to examine and approve all plans for piers, docks and bulkheads to be constructed herein. In conjunction therewith, any and all lot owners shall submit said plans in substantial conformity with the above restrictions to the Architectural Committee, and shall construct any dock, pier or bulkhead, only with the prior written approval by the Architectural Committee of said plans. No vessel, including, but not limited to any boat, yacht, ship, or other floating conveyance shall be moored or permitted to be moored overnight beyond any pier line, except as provided herein, or as established by any appropriate public authority , except in authorized mooring basins. A vessel shall not be permitted to anchor , moor or stand overnight in any waterway except with the specific prior written consent of the Company; and in any event, no vessel or other floating object shall be anchored; moored or placed offshore in any of the waterways so as to interfere in any manner with navigation. Refuse, trash or waste material, including, but not limited to petroleum products or wastes, leaves and sewage, shall not be dumped, thrown, ejected or otherwise deposited into or near any waterway. All Federal , State, and local laws, statutes and regulations relating to the use of navigable or tidal waters shall be complied with at all times. (a) Violations of any covenant or restriction may be remedied by the Company, and the reasonable expenses thereof shall be chargeable to the then owner of the lot and by payable upon demand. The foregoing shall be alternative, or in addition, to the enforcement provisions of subparagraph 16(b). (b) Enforcement shall be by proceedings at law or in equity brought by the Company, its successors and assigns, or by the owner of any lot, against any person or persons violating or attempting to violate any covenants to enjoin such violations or attempted violations or to recover damages or both. (c) The failure of the Company to enforce any covenant or restriction herein or to remedy any violation thereof, at any time, or from time to time, shall not constitute a waiver by the Company of those or other provisions of these restrictive covenants. Invalidation of any of the aforesaid covenants and restriction by judgment of court order shall in no wise affect any of the other covenants, which shall remain in full force and effect. The Company reserves the right to amend this declaration of restrictive covenants and easements at any time so long as it is the owner of more then (50%) percent of the property described herein. We will continue to remain Stewards of this Information hoping for a 'Certified Local Government' like so many other Florida Leadership Cities already are. Hoping for a Museum like Flagler Beach already has.